Your Guide to Northampton Pride 2017 - Utter Buzz! In the last several years, Northampton Pride has been a blowout celebration of all people, places, and things LGBTQI, but this year the event is leaning more toward its political roots. They’re putting the march back into the parade, so to speak. 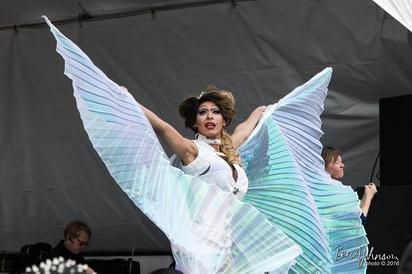 Northampton Pride started in the early 1980s with the Lesbian and Gay Liberation March, said JM Sorrell, spokesperson for NoHoPride, the event’s organizer. Up until the November 2016 presidential election, it seemed that equal rights for all people was making steady progress forward: federal marriage equality, discrimination protection, and the end of the military’s Don’t Ask-Don’t Tell policy were good signs. But within his first 100 days in office, President Donald Trump has wiped LGBTQI data collection programs from the U.S. Census and health services; rolled back Obama’s “Fair Pay and Safe Workplaces” order, which required companies seeking federal contracts to show compliance with anti-discrimination laws; and cut programs that targeted LGBTQI people for homelessness prevention services. Perhaps emboldened by the president’s actions, 29 states have introduced about 100 anti-gay bills in 2017, according to the Human Rights Campaign, a national gay civil rights organization. The parade, parking, and the fest are all free, open to the public, and going down rain or shine. Sorrell said it costs about $40,000 to put them both on every year and that NoHo Pride counts on the assistance of volunteers and donations to pull it all together. Only the parade and the festival at the Three County Fair are official NoHoPride activities. Other parties are unofficially attached to the weekend. “Bring the kids, bring everyone. I see more kids here every year and I see more high school groups, even middle school groups these days; it brings tears to my eyes,” she said. Kristin Palpini can be reached at kpalpini@valleyadvocate.com. 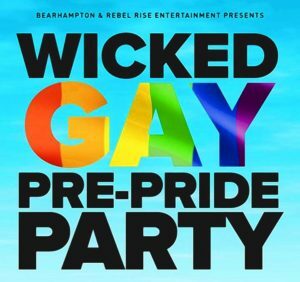 Wicked Gay Pre-Pride Party: Get yourself in a celebratory frame of mind before the parade with the 121 Club’s pre-party. The Easthampton bar will host the event organized by Bearhampton and Rebel Rise Entertainment. 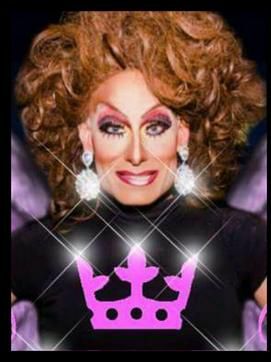 They’ll have a RuPaul’s Drag Race viewing party at 8 p.m. and dancing to “gay beats” with DJ Arrow starts at 9 p.m. Cover is $5. Shabbat “Erev Pride” Service: The invite to this event rather simply lays out why you should go: “Oy, what a year we are having! Now more than ever let’s re-affirm our GLBTQ pride.” On Friday at 7 p.m. Beit Ahavah will host a Kabbalat Shabbat service led by Rabbi Riqi Kosovske and Randy Furash-Stewart with singers including Justin Sundell-Thomas. Plus, rainbow cake! A family and kids version of the party, a “tot Shabbat,” is being held 5:15-6:30 p.m. with a veggie potluck. 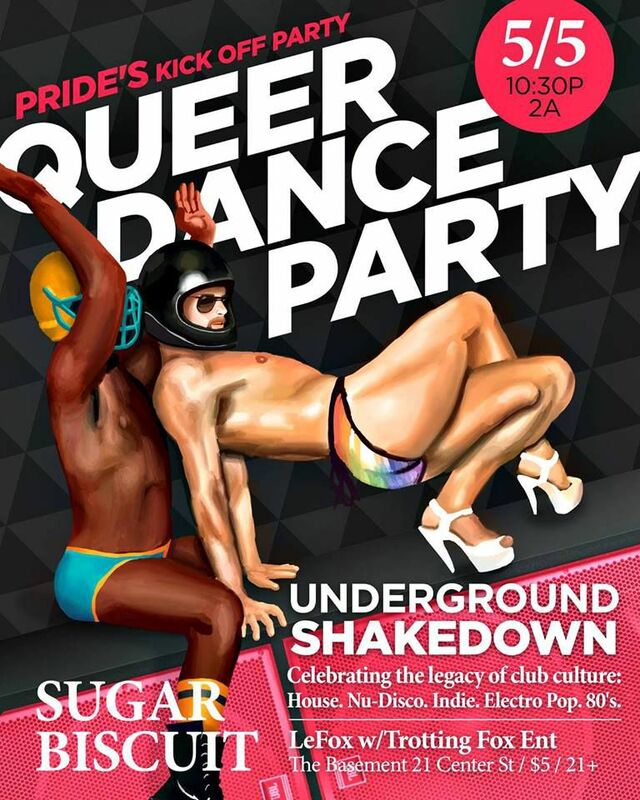 Sugar Biscuit — Underground Shakedown Pride Kick-Off Dance Party: Check out Noho resident fairy boi DJ LeFox, with Trotting Fox Entertainment, dropping an eclectic blend of soulful dance music — Deep House, Nu Disco, Indie, Electro Pop, ‘80s, and gay anthems — at The Basement on Center Street in Northampton. This annual pre-Pride party celebrates the “other” in queerness — that means break out your drag, rags, and glitter, and strut your look. The theme this year is “going back to the club culture roots” that inspired the party in the first place. Show starts at 10:30 p.m., cover is $5. Shabbat Morning Service: Rise and shine, sunshine: today there is a 9:30 a.m. service at B’nai Israel led by Rabbi Justin David. Kiddush follows the service and brown bag Shabbat lunches will be provided to people to take to the parade. Pride Day Parade: The 36th annual Pride parade is stepping off in downtown Northampton at noon. There will be motorcycles, crazy-colorful floats, and marchers representing businesses and organizations that love the gay community. Bring sunscreen and water: the parade route is about 1.1 miles and may take up to an hour and a half to go by. The parade starts in the parking lot at Hampton Avenue (it’s the staging area), then winds down Brewster Center and up Old South Street. From there, the parade will take a right turn onto Main Street and march to the Pride Day Festival at the Three County Fair Ground off Bridge Street in Northampton. 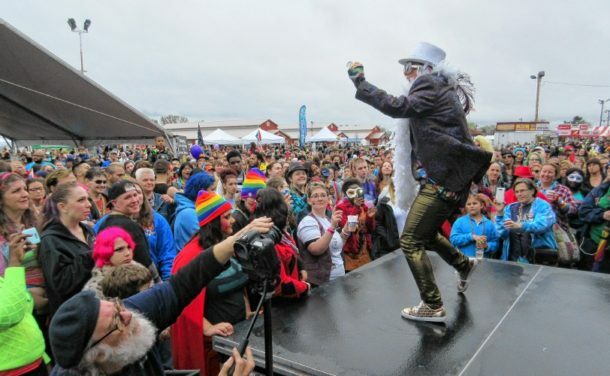 Pride Day Festival: Starting at 1:30 p.m. at the Three County Fair Grounds in Northampton, NohoPride has organized an all-day party with music, vendors, and a lot of entertainers. Emcee’d by last year’s host, Cindy Foster, the stage will feature music by Ephraim Adamz as well as speeches by Northampton Mayor David Narkewicz, women from the Valley Women’s Martial Arts, and motivational speaker Brennan Srisirikul. A contingent of drag queens and kings is ready to entertain the audience, too. The show will be hosted by Felicia Forrestor with Hors as co-host. Performers will include: Mia E Z’Lay, Whitley Nycole DeAire’, Justin Snyer, Devin Graberass, and Serenity Lockhart. The event is free, though donations are appreciated. 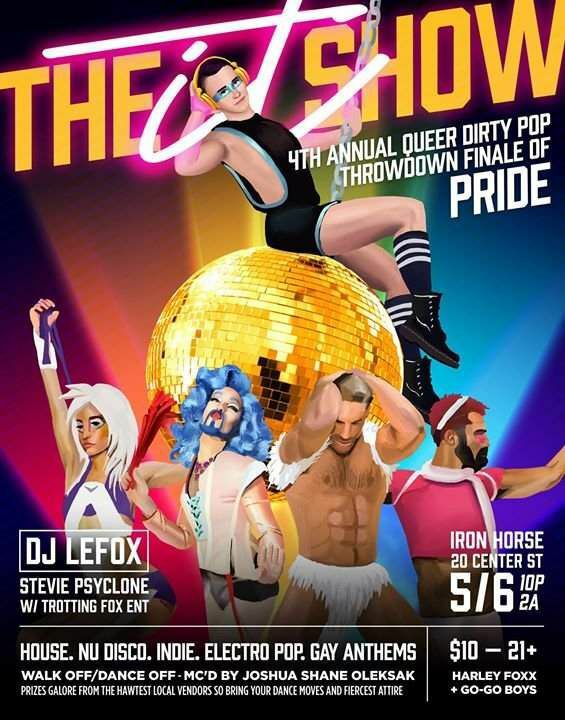 The It Show — 4th Annual Queer Dirtypop Throwdown Finale of PRIDE: Featuring LeFox and Stevie Psyclone with Trotting Fox Entertainment, this party is going to be fierce and hawt. Harley Foxx and Go-Go Boys galore will be performing. But the best part: there’s going to be a Walk Off/Dance Off MC’d by Joshua Shane Oleksak. Head over to the Iron Horse in Northampton at 10 p.m. for the party. Cover is $10. Pride Night Bloke: If you’re into gay dudes, booze, and dancing, organizers of this Northampton party, say Bloke night is for you. Presented by Rebel Rise Entertainment DJ Brenden will be playing hip-hop, Top 40, and club mixes all night. The party starts at 11:30 p.m. at Bishop’s Lounge in Northampton. Cover is $5.